Politicians’ popular claims against capitalism rely on false assumptions about markets and governments. However, other candidates, proposing or supporting very similar changes, have claimed they are (modified) capitalists. People would have far fewer political grievances in a decentralized system. Recently, a dozen sheriffs in Washington state announced that they would refuse to enforce the newly passed Initiative 1639, which raised the legal age of purchasing a firearm of any sort to 21, expanded background check requirements, increased the waiting period, and mandated weapon storage when not in active use. Predictably, political proponents immediately threatened these sheriffs, who were hired to enforce county, not state, laws, with legal action. Of course, when I say passed, what I really mean is that 14 of 39 counties in Washington decided the referendum was a good idea. Jon Alexander has raised some serious challenges to the concept of “arming teachers” to strengthen security in our schools. Allow me to shift the debate somewhat by adjusting its fundamental assumptions. In the U.S. today, at least fourteen states have laws on the books which allow school boards to authorize concealed carry of firearms by school staff, under various conditions, while ten more states do not restrict concealed carry to school staff members only, although most of them still require specific, individual permission of the governing school board. The number is growing every year: last year, Wyoming joined; this year bills are pending in Michigan, Pennsylvania, and Florida. Meantime, in Ohio alone, over 1,000 trained school staff members are carrying concealed handguns in more than one-quarter of the school districts in that state. In South Dakota, Texas, Colorado and other states, significant and growing numbers of school staff members are already legally carrying concealed firearms – while Utah has allowed anyone with a state concealed carry permit to carry a firearm on school property for going on 19 years. So, this is not a new idea; quite the contrary. We have a considerable amount of experience with it, and because of the decentralized approach, wherein state laws and school board policies differ, we have quite a variety of experiments underway. How is it working out? Famously. While mass shooters have not been particularly deterred by the presence of uniformed School Resource Officers (Columbine High School and Parkland, Florida being particular examples), there is no evidence of a single school shooting taking place in any district across the country where trained, non-law enforcement school staff members are carrying concealed weapons. Correlation is not causation, but that fact cannot be easily dismissed. There are also zero examples of injuries resulting from the kind of mishaps commonly predicted by the skeptics: no accidental shootings, no rowdy students shot by frustrated teachers, no gun take-aways by students. They’re just not happening. Away, way back in 1977, when I began writing my first novel, _The Probability Broach_ (still in print, after four decades), I was regarded as something of a nutcase because I argued that American society would be a much better, safer place if everybody who wanted to, carried a gun. I was by no means the first to do so, nor was I the only one at the time, but, except for Robert A. Heinlein, Elmer Keith, and the ghost of H. Beam Piper, I often felt very much alone in my simple, straightforward, common-sense advocacy of exercising one’s natural rights under the Second Amendment to the Constitution. 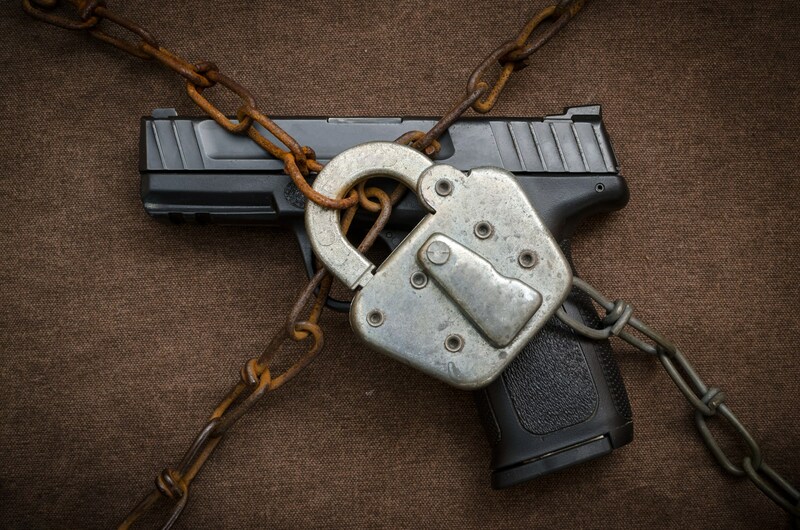 Now, of course, forty years later, armed self-defense has become a social movement. The degree to which I share responsibility for that is debatable, but I am proud of any part I may have had in it. Last weekend (no, I am not changing the subject) was a pretty lousy one for peace and civil order in the United Kingdom of Great Britain. Egged on by various evil shamans (one of them in the States), Islamic terrorists employed an automobile and big knives to wound and murder dozens of innocent individuals who were trying to enjoy a warm summer evening—in a near-Arctic climate that doesn’t offer many of them—and whose only “crime” was that they did not choose to follow the benighted religious precepts of a 7th century Arab merchant-trader. Does National Defense Require the State? This little story actually incorporates a common objection to anarchy—namely, the idea that because, if a country abolished its government, other countries would not necessarily follow suit, the governments of those other countries would be free to, and would, simply take over the country that, lacking a government, also lacked an effective means of defending itself against takeover by a foreign power. This thinking presumes at least two critical ideas: first, that defense of a population requires a government that rules that population; and, second, that if a government has the power to take over another country, it will do so. The marijuana legalization movement has been holding its breath, waiting to see how President Donald Trump will address the issue. Public opinion and state law have leaned heavily in favor of decriminalizing the controversial cannabis plant over the last several years, signaling the inevitable downfall of the government’s war on drugs. However, as numerous state victories gave advocates hope that the end of prohibition was near, the unexpected election of Donald Trump threw the legalization movement a curveball no one was anticipating. Legalized marijuana is projected to create a quarter of a million jobs by 2020. While the future of marijuana in America is still unclear at the moment, if Trump wants to keep his campaign promises of job creation and financial growth, he should strongly consider the economic benefits of marijuana legalization. As a presidential nominee, Trump spent much of his campaign promising national job growth. Reaching out to the blue collar working class, Trump promised to bring jobs back to American manufacturing. However, if Trump is serious about fostering an environment of economic prosperity and job creation, he may want to set his sights on the burgeoning marijuana industry instead. According to a recent report released by New Frontier Data, the marijuana industry is projected to create more than a quarter of a million new American jobs by the year 2020. By the Bureau of Labor Statistics’ own projections, the legalized cannabis industry is expected to outpace growth in any other sector over the next few years, including American manufacturing. In fact, manufacturing jobs are expected to decrease by 814,000 over the next seven years. Additionally, the marijuana industry is currently estimated to be worth about $7.2 billion. Given its current success and expected trajectory, the entire industry is expected to grow at a rate of 17 percent annually. Likewise, the New Frontier Data’s report estimates that the medicinal market alone will increase its worth from $4.7 billion to $13.3 billion by the year 2020. Of the 25 states that have decriminalized cannabis in some capacity, seven of those states have allowed for its recreational use. As a result, the recreational industry is also expected to increase its worth from $2.6 billion to $11.2 billion by 2020. While these projections are bound to have positive effects on the national economy and create a plethora of new American jobs, the estimates will never come to fruition if the Trump Administration decides to backtrack on the progress made thus far. Had Hillary Clinton won on election night, as many had expected, it is highly unlikely that the war on drugs would have suddenly come to a screeching halt. Not only is Clinton’s own track record on the matter weak, but her husband also contributed greatly to the perpetuation of the problem. Former President Bill Clinton helped escalate the war on drugs through his support of mandatory minimum sentencing laws and other policies that were prevalent during the “tough on crime” era of the 1980s and 1990s. However, Mrs. Clinton’s terrible track record on the issue does nothing to excuse Donald Trump, should he make the same mistake. While Trump is not a strict ideologue by any means, he has unfortunately chosen to surround himself with advisors and cabinet appointees who have struck fear into the hearts of advocates of marijuana policy reform. Trump’s decision to nominate Jeff Sessions as his Attorney General only heightened this paranoia among his critics. Sessions has been a longtime supporter of civil asset forfeiture, which essentially incentivizes law enforcement to use the drug war as a pretext for stealing property from anyone merely suspected of drug-related activity. Since Sessions has the legal authority to impose federal drug laws on the states, this comment is quite concerning, to say the least. While Trump’s own comments on the matter have been somewhat neutral, Press Secretary Sean Spicer added fuel to the fire last week when he hinted that the White House might soon begin enforcing federal marijuana laws once again. Under the direction of former Attorney General Eric Holder, the federal government agreed to more or less “look the other way” when states made the decision to legalize cannabis. This policy has allowed states like Colorado to add over $1 billion worth of revenue to their local economy and create new jobs for its residents. Ironically, the war on drugs, which Sessions adamantly supports, is responsible for that increase in potency, as economist Mark Thornton has demonstrated. According to “the Iron Law of Prohibition,” when substances are prohibited, black market providers are incentivized to increase potency because more potent forms take up less storage space, are easier to transport, and sell for more money. This is considered necessary to mitigate the risk of being caught and incarcerated. Session’s Reefer Madness-inspired statement is absolutely frightening considering his position of authority as Attorney General of the United States of America. The White House might actually begin enforcing federal marijuana laws once again. But in the spirit of maintaining optimism, there is still reason to hope that Trump’s alleged commitment to economic growth will overpower the draconian beliefs held by some of his cabinet appointees. Trump was elected as the “no nonsense” businessman who was going to fix our national economy and create jobs for the American people. As America’s “economic savior,” his supporters firmly believed he was the candidate who would restore prosperity to the middle class. This is the promise that ultimately got him elected to the highest office in the land. Since assuming office, he has shocked the public by actually fulfilling most of his campaign promises— which has been both slightly encouraging and downright terrifying. While there can be no defense of his love for protectionist policies, he has still maintained his support for a free market economic system. If this is true and he is as committed to economic reform as he claims to be, then perhaps the economic repercussions of marijuana legalization can change his mind, or at least drown out the backward influence of his advisors. Chairman Trump may well be a child in a man’s body – erratic, lacking in finesse, as articulate as a gangsta rapper, contradictory, and missing the cognitive functions allowing one to think before acting. But.. But… he does seem smart enough to have thought a little about Russia. Thought alone is a welcome surprise from Washington. The establishment for their part are fuming! 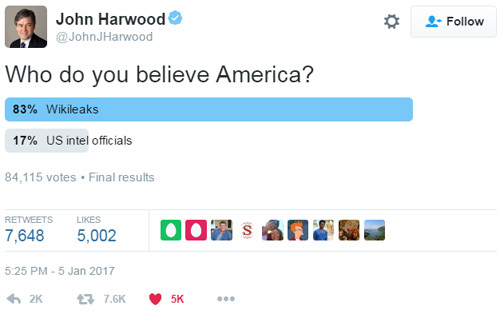 CNBC’s John Hardwood decided to conduct a Twitter poll to see who the American people trusted when it came to the DNC hacks. Did they believe Wikileaks, who deny Russian involvement, or do they believe the intelligence community who has blamed Russia despite ZERO hard evidence being shown to the public? The results were shocking and it stunned the media elite! The absurdity over Russia has turned into a social meme. Few buy the narrative and those that do increasingly find mainstream thinking to be questioned. American health care is not very effective in curing diseases. The National Center for Health Statistics projects over 1.6 million new cancer cases and almost 600,000 cancer deaths for 2016. Among those who suffer heart attacks, fewer than 50% are alive five years later. Republicans do not want to repeal the regulations that make healthcare expensive and ineffective. Medical treatment is so expensive that people need insurance to survive financial catastrophe in case they become ill or get hurt. Even middle class folks who need extensive medical care cannot begin to pay the costs. Those facts supported demand for Obamacare, the halfway point on the road to socialized medicine. Republicans argue that American medicine was the finest in the world, with only minor problems, until it was ruined by Obamacare. But American medicine has been plagued with extraordinarily high costs and ineffective treatments for many years. According to Forbes.com, in the Commonwealth Fund’s 2014 healthcare survey of the eleven wealthiest countries, the USA came in last. Republicans campaigned to repeal Obamacare. But they waffle about its replacement, because they sense they have no answers to the problems that predated the disastrous Affordable Care Act. Republicans want medicine to be inexpensive and effective, but they do not want to repeal the morass of regulations that make it expensive and ineffective. After the Civil War, there were virtually no regulations of medicine in the United States. People would choose their doctor and treatment, and doctors would thrive or languish according to the exigencies of the market. Profit-seeking medical schools flourished and graduated many practitioners. Politics aside, the gem of the week is tucked away in a Delta operators observations abut conducting missions in non-permissive environments such as those found in Yemen. Bill Lind, John Boyd, Martin van Creveld, Chet Richards, and many more have been talking about this eventuality for decades now so this comes as no surprise for most people who keep an eye on these types of developments. Decentralization is the only logical path forward, and fortunately, it’s the simplest to achieve in the immediate future and will pay much higher dividends than the current top heavy system. The fourth generation of warfare is upon us, that means the 5th isn’t far behind. You can’t beat today’s problems with yesterday’s solutions, especially when they are generations behind. Your understanding of the OODA loop and having the appropriate respect for this theory will allow you to critically build on a solid foundation which will, in turn, allow you to vet ideas based on their merit, not on their popularity. Pressing towards a tighter or more controlled OODA loops will guide you in selecting appropriate techniques and actions that will give your efforts real power. 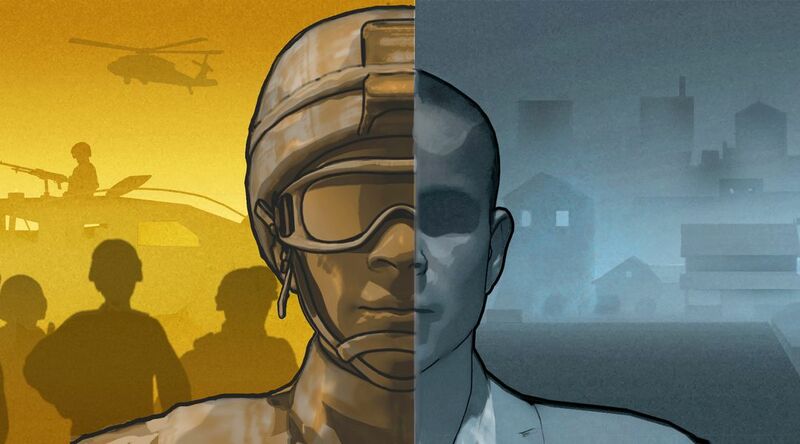 While OODA loops are relevant in all three levels of warfare (strategic, operational, and tactical), in this section we will continue or discussion of the OODA loop and how it functions at the tactical level of gunfighting. In order to highlight the above concepts and in order to be able to see the accumulative effect one’s actions can have on the situation, let’s pretend we have a god’s eye view of a gunfight developing on a city street. What is the Strategy for Winning a Gunfight? The strategy for winning a defensive gunfight is converting disadvantage to advantage. Let’s clarify what we mean by defensive combative firearms training. Because you are not the one instigating the confrontation, you will initially be at a disadvantage and in a reactionary and defensive state because you are behind in what John Boyd called the decision making process or the “OODA Loop”. Conversely, because your adversary is selecting the time, palace, conditions, and weaponry for the confrontation – he will initially start with the initiative as the causal factor in your situation because he has already completed may OODA Loops before you ever even knew of him or his intent. While starting in a reactive state is an initial disadvantage; proper training can teach you how to convert this initial reactive and disadvantageous situation to your advantage and to the disadvantage of your adversary. Solid training programs can teach you how to react in a manner that will cause your adversary to react to your actions, and exploiting this initial success can allow you to then wrestle the initiative away from your adversary and then keep him in a reactive state so you can end the with a more favorable outcome for yourself. The key here is for you to become the causal factor to your adversaries plan for you, and thereby placing him in a disadvantageous reactive state, and the more solid your skills are, the easier it will be for you. Obviously, converting the initial disadvantage to advantage is key, and this key does have a price, and that price is effort in training. What is tactics and why should I care? I will flesh out the above paragraph shortly, but so as not to string you along, and answer the question about why you should care about the study of tactics I can think of a few compelling reasons.